Daniel Mallia was an HNN intern. Marilyn Monroe is an American pop-culture icon, famous for her stunning looks and fashion, movie performances, free spirit, scandalous behavior and secretive involvement with John and Robert Kennedy. However, she is also remembered for the mysterious conditions surrounding her death, at age 36, on the night of August 4-5 1962. While the immediate cause of death may be relatively clear, the claim of suicide is not, and many wonder if her death had more to do with external forces than internal demons. The generally accepted cause of Monroe's death at her Los Angeles home on that fateful evening is a lethal dose of barbiturates (sedatives), Nembutal and chloral hydrate. The initial autopsy, conducted by Dr. Thomas Noguchi, had indicated that this was the cause of death and the mode of death was ruled a probable suicide—there was no immediate investigation or criminal charges filed. At first glance the ruling of suicide was not unreasonable given the circumstances. Marilyn apparently had been depressed, allegedly dealing with threatening calls earlier in the day from a female caller furious over Monroe's relationship with Robert Kennedy. Though Monroe seemed to be drugged (possibly suppressed by Nembutal that she had likely taken) and in poor temper towards the evening, Joe DiMaggio’s son spoke with her shortly after 7:00 pm about breaking off his engagement. At that point she appeared to be in better spirits, a condition confirmed by her psychiatrist, Dr. Ralph Greenson, who spoke with her on the phone afterwards, and Eunice Murray, a housekeeper employed by Greenson to aid and watch over Monroe. But within the hour, Peter Lawford, Robert Kennedy's brother-in-law and the owner of the house where Monroe had met and spent time with the Kennedys, phoned her to invite her over but Monroe apparently sounded depressed and groggy, reportedly telling him: "Say goodbye to Pat [Newcomb—her agent and friend], say goodbye to the president, and say goodbye to yourself, because you're a nice guy." Monroe had been receiving psychiatric care since 1961 and had been on something of a downward spiral with her divorce from Arthur Miller and increasing problems of discipline with movie-making, culminating her dismissal from Fox. She was subject to mood swings, known to rely on alcohol and pills, and she had made multiple suicide attempts in the past. With the high levels of barbiturates in her system as a clear cause of death, the presence of the coordinating medication bottles in her room, as well as the absence of any clear signs of foul play on the body, pointed to the conclusion of suicide. But was it suicide? Many factors point to an accident or worse, murder. No drink was found at the scene which Monroe could have used to swallow the pills, and there were no traces that the lethal dose had passed through her stomach. There was evidence that she was alive for hours while the Nembutal in her system was digesting, as well as high concentrations of chloral hydrate in the liver rather than in the blood, and signs that Monroe had died quickly, from an additional lethal dose rather than the Nembutal. Above all, there was damage to the colon. Could she have been given a lethal dose through an enema? Though Monroe was supposedly something of a fan of enema, if in fact that was the case it means that someone else was involved as she could not have administered it herself. Further debatable evidence against the suicide theory comes in the form of tapes that Monroe made for Dr. Greenson. The only other person to have ever heard those tapes, was John Miner, a district attorney who served as an investigator after Monroe's death. John Miner himself promised not to reveal the contents of the tapes, of which he made a transcript, but he broke his promise to speak out against allegations that Greenson was responsible for her death. Based on those tapes, which he felt revealed that Monroe was optimistic about the future and anything but suicidal, Miner concluded that she must have been murdered. But Greenson is long dead—Miner believed that he destroyed the tapes before his death—and Miner himself died just last year, and any other secrets they knew about the tapes and Monroe's death are gone with them. Who could have administered the lethal enema? The accident theory points to the possibility that Monroe's internist, Hyman Engelberg, and Greenson, both of whom were trying to wean Monroe off of Nembutal, did not coordinate their prescriptions. Engelberg gave Monroe the Nembutal, which she had been heavily indulging in that day and was in her system when someone, either Greenson (who didn't know about the Nembutal) or Murray (who didn't know of the adverse effects of mixing the drugs), gave her the enema of chloral hydrate, which in turn worked with the Nembutal to kill her. The problem is that this theory, of course, is dependent on Monroe being alive when the unknown person gave her the enema and it is here that one is lead to the almost undecipherable mess of the night of August 4-5. The police were called at 4:25 am and they arrived to a scene that may have already been manipulated. Monroe's body seemed to have been moved and almost certainly was not in the position where she died. There are witnesses, including an ambulance officer, who have testified that Monroe was moved from the house but then died elsewhere and was returned back to the house as a part of a cover-up. Others suggest incriminating documents relating to the Kennedys had been removed, possibly under the direct orders of Robert Kennedy. The explanations initially offered by Murray and the doctors were not dependable and eventually changed. They began by saying that Monroe had been dead for hours, which corresponded with the time frame the undertaker projected for the time of death (9:30-11:30 pm) based on the advanced rigor mortis, but the story was soon changed. Murray began to claim that she only noticed something wrong at 3:30 am (she said she saw a light from under Monroe's locked door, but both of these aspects were later proven to be impossible), at which point she called Greenson. Engelberg was also contacted. Greenson arrived, pronounced Monroe dead, and then the three delayed for an unknown reason before calling the police. But years later in a BBC investigation in the 1980s, not knowing that a microphone was still recording, Murray offered that when Greenson arrived, Monroe was still alive. There are endless theories and suggestions about what actually occurred on that night—about when Monroe actually died, at what time Murray, Greenson and Engelberg were dealing with her and what they did, whom Monroe telephoned, and who visited Monroe's house that afternoon and evening. It is all extremely unclear and is only made worse by her involvement with the Kennedys. Robert had a close friendship with Monroe, and though it is not known if that relationship became sexual, it is undeniable that she had a sexual relationship with JFK. If made public it could have become a major source of embarrassment and it was not quite an idle threat, as Monroe reportedly was upset over the realization that JFK was not going to leave his wife for her. Monroe had also apparently spoken to John on sensitive political issues and was even considered a threat to national security because of this and her association with some openly Marxist people in Mexico. Furthermore, Monroe is alleged to have had knowledge of the relations between the Kennedys and Sam Giancana and the mafia. (Some wonder if it was in fact the mafia who had Monroe killed as an act of revenge against the Kennedys). Australian film director Philippe Mora even discovered a questionable FBI file from 1964 that discussed a plot, allegedly drawn up under Robert's knowledge, to induce Monroe to commit suicide because of the national and political threats she posed. As a result there is extraordinary speculation about Monroe's phone calls that night and the activities of Robert Kennedy and Peter Lawford, who may have been secretively overseeing the execution of the plan. (Many doubt that is the case due to Robert's reputation of moral integrity). Ultimately, the loss of tissue/organ samples after the initial autopsy (suspicious but apparently not uncommon), the absence of phone records, the destruction of police records (in accordance with procedure) and the great spectrum of confusing and often contradictory theories and testimonies have conspired to keep the truth a mystery. 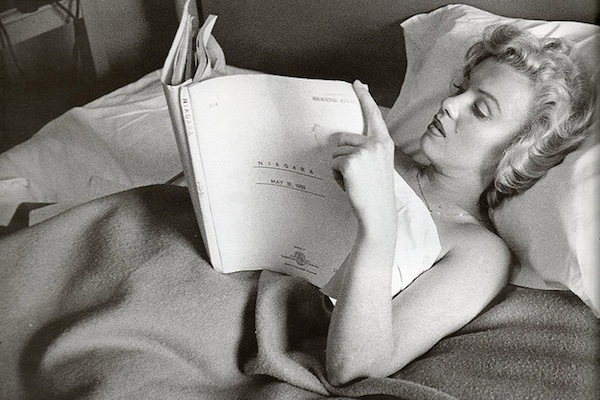 Of course, there’s always the very real possibility that Marilyn Monroe did simply commit suicide.